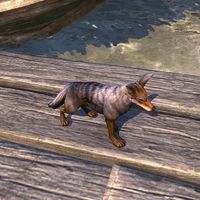 The Jackal of Tamriel is called by some the "thieves' dog" because it's quick to sniff out sources of food, and clever enough to figure out how to get at them. Once tamed, they serve as loyal companions. A Jackal pet is received when entering Abah's Landing for the first time, as part of the DLC loyalty reward program. It occasionally howls, digs at the ground, or catches mice. Its default name is "Mischief". The planes of Oblivion are infinite in their variation - and so are their vermin. The Jackdaw Daedrat is a bony Daedric rodent that likes to collect shiny things like your jewelry, and nip and nibble at things it shouldn't, but at least it's cute, right? 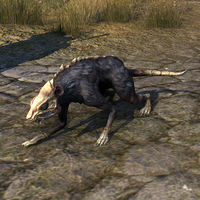 Jackdaw Daedrats are Daedric rat creatures that are available from the Crown Store for 700 for a limited time. Its default name is "Pestiferous". "Sweet young things like to give this one kittens as keepsakes," says Eye of the Queen Razum-dar, "but raising a pet is not consistent with Raz's romantic but itinerant life of intrigue. Perhaps you could give cute Ja'khajiit a good home, yes?" Ja'khajiit Raz was available from the Crown Store for a limited time during June of 2018. Its default name is "This One".